1. 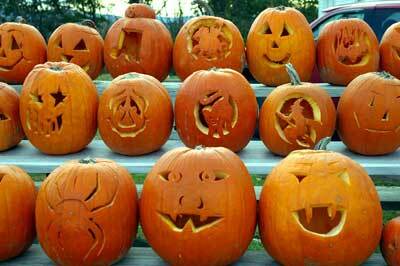 Choose a pumpkin that is an appropriate size and shape for the design you wish to carve. Tall pumpkins may lend themselves better to faces. For designs with lots of cutouts, look for large, round pumpkins with smooth surfaces. Look for a pumpkin with a flat bottom that will sit upright. 2. Wipe the pumpkin clean with a soft damp cloth and dry. 3. For a lid: Draw a 6-sided lid with a V-shaped notch at the back. This notch will serve as a guide to replace the lid. For a bottom: Draw an opening on the bottom of your pumpkin if you want to sit it over a candle. Be sure to draw the opening large enough so that it will be easy to reach inside and scoop out the contents when cut. 4. Only grownups should do the actual cutting. To do so, cut along the drawn lines for the lid or bottom opening with a sharp paring knife. If cutting a lid, angle the blade toward the center of the pumpkin to create a ledge that supports the lid. If cutting a bottom, cut straight into the pumpkin. 1. Scoop out the seeds and strings from inside the pumpkin. Use a large spoon or ice-cream scoop or the plastic scraper scoop that is made for this purpose. 2. Scrape the inner pulp away from the area of the pumpkin that you plan to carve until the pumpkin wall is approximately 1 inch thick. To check the thickness, insert a straight pin into the wall. 1. Decide which patterns you want to use, and trace the design onto tracing paper. 2. Tape the patterns to the pumpkin. 3. To transfer the patterns to the pumpkin, use a pushpin, corsage pin or the tip of the poker tool to poke holes through the paper and into the pumpkin along the design lines about 1/16 inch to 1/8 inch apart. Make sure that all of the lines have been transferred. Remove paper, and use a pen or dull-point pencil to connect the dots. Save the paper patterns to refer to while carving. 4. Cradle the pumpkin in your lap, and keep the pumpkin saw or small paring knife at a 90-degree angle to the pumpkin while carving. Carve from dot to dot to cut out the pattern shapes. If an older child wants to help, the saw is much safer than a knife but still requires adult supervision. Push the cut pieces into the pumpkin with your fingers. If a large piece becomes wedged, cut it into smaller pieces. 5. If you happen to cut through a pumpkin section by mistake, reattach the pieces with straight pins or toothpicks. 6. Rub all cut pumpkin edges with petroleum jelly to keep it fresh longer. 7. Insert a short column candle, votive or battery-operated light in the pumpkin. If the candle is not in a holder, form a holder from aluminum foil and secure the candle with a few drops of melted wax. 8. If candle smoke blackens the lid, cut a chimney hole in the lid top to vent the smoke and heat and preserve your design. Mark a dot design using a template or straight edge. Drill dot holes with electric screw-driver or cut out design with knife. Place candle inside pumpkin and secure to bottom with hot wax. Before you begin, carefully cut a circle around the pumpkin stem, lift off the lid and remove the seeds from the lid and inside the pumpkin. Remove the cookie cutter, using a needle-nose pliers if needed. With a small serrated knife (or the serrated saw from a pumpkin carving kit), follow the pattern made from the cookie cutter to cut out the image, making sure to cut all the way through the shell. With one hand inside the pumpkin, push out cookie cutter image from the pumpkin and discard.